If you are looking for a pool cleaning service in Pinellas County, look no further. Triangle Pool Service is an experienced and professional pool service that has been servicing both residential and commercial properties in Clearwater, Largo, St. Petersburg, Palm Harbor, and nearby areas for years. Triangle understands how important pools are to their owners. They’re the source of relaxation for a family. Plus, they also provide fun and relief on hot, sunny days and are a perfect way to entertain guests. Unfortunately, the upkeep of them is not as enjoyable. That’s where Triangle comes in. There are many factors that need to be considered when maintaining a pool, such as the pH levels, the chlorine levels, chemical balance, filtration, and more. By taking advantage of our pool cleaning service in Pinellas County, you won’t have to worry about any of these things. Triangle will clean your pool, whether it is residential or commercial, on a regular basis. Your life will be significantly less stressful if you are not required to worry about the upkeep of your waters and able to fully enjoy them at all times. Depending on your needs, you can choose a customized schedule for cleanings that make sure you have sparkling, clean water at all times. For our residential clients, you can receive special pricing on a weekly basis. Some of our special offers include one month free after six months of services; or free use of a chlorine generator. For existing customers, by referring a friend, you can receive another month of free services. Commercial clients are taken care of with comprehensive services that include three visits a week, which includes chemicals and labor, vacuuming, skimming, tile, and filter cleaning as necessary, and in-house water analyses. Our commercial pool cleaning service covers everything you need to keep your water feature a beautiful focal point for your business. 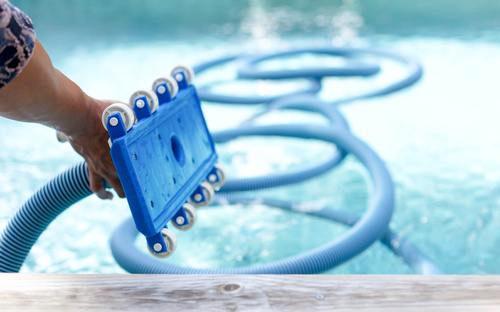 The right pool cleaning service offers more than just routine cleaning support. Choose a company in Pinellas County that also provides maintenance, repairs, and installation assistance whenever you need extra help. Maintaining your swimming waters is just as important as keeping them clean. Fortunately, the professionals at Triangle are equipped to make sure everything is in working order at all times. For more information about our offerings in Pinellas County, call us today at (727) 531-0473 or contact us online.